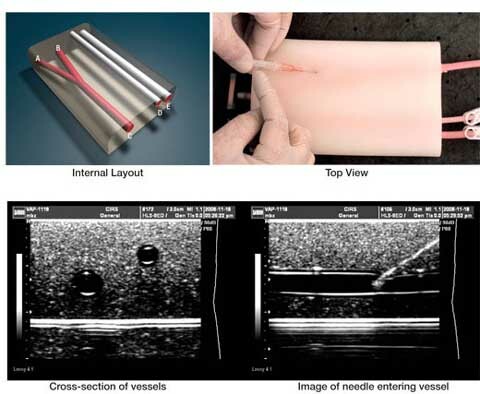 The CIRS Model 072 Vascular Access Training Phantom Kit was designed to provide a realistic training medium for needle insertion. The phantom is made from a durable elastometric compound mimicking the tactile feel and puncture resistance of soft tissue. This self healing material has realistic acoustic properties allowing imaging of the simulated palpable vessels under ultrasound. 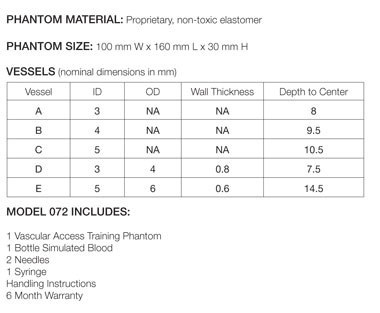 The phantom includes one bifurcated vessel and 2 straight walled vessels at a variety of depths and diameters to simulate a range of challenges often encountered in the clinical environment. The phantom measures approximately 100mm (W) x 160mm (L) x 30mm (H). The phantom can be easily replenished without leakage using a syringe (included) and a stopcock enables increased vessel pressure for more realistic simulation. The kit also includes needles and a supply of simulated blood. The phantom requires no special handling and will not dry out.